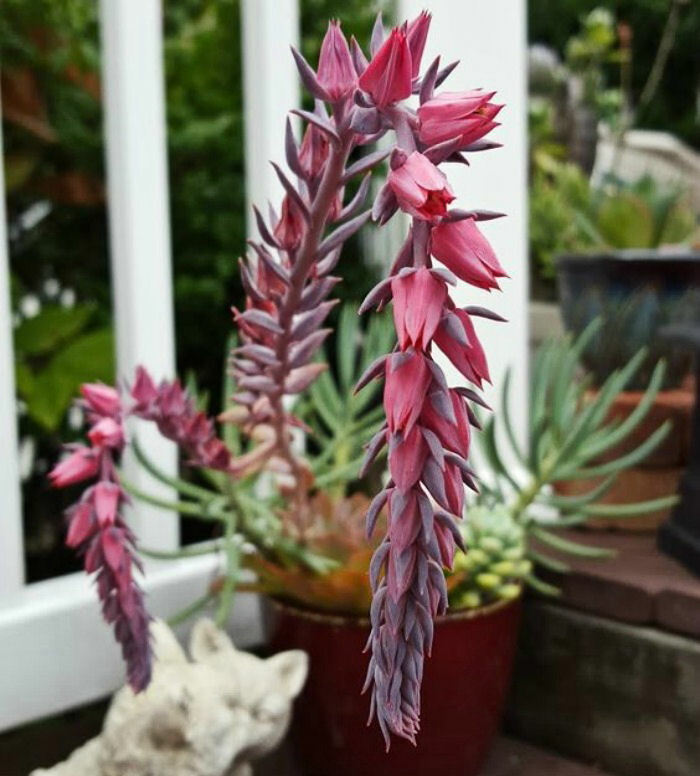 Echeveria Neon Breakers is a Renee O’Donnell hybrid of the succulent Pink Frills crossed with an unknown parent. It is a drought tolerant succulent with green leaves that have pretty pink frilly edges and deep margins. This pretty succulent is very popular for many reasons. It has highly colored leaf margins, especially when the plant gets ample sunlight. It is also more resistant to pests that the normal echeveria and it a fast grower. Another popular feature of echeveria neon breaker is that it is a continuous grower with no apparent dormant season when grown outdoors in hotter zones or as a house plant. Echeveria Neon Breakers is drought tolerant once established. Water thoroughly and then allow to try out to the touch before you water again. The plant will benefit from a bit of extra watering in the hottest weather to prevent the leaves from shriveling. This succulent needs very bright light to keep the colorful leaf margins. In lower light situations etoliation will happen (stretching of a plant towards this light) This is characterized by very long stems that are weak and have small leaves. The color will also weaken. The plant does best with morning sun with some protection from the hot afternoon sun. The color of the leaf margins are the brightest if you can find a spot where the plant gets continuous bright light during the day. My plant shows narrow leaf margins. Mature plants that get just the right amount of sunlight develop very deep leaf margins. However, too much direct sunlight in very hot climates will cause the leaves to burn and scar. In their natural habitat, Echeverias often grow on the sides of mountains in rocky areas at higher altitudes. In this type of habitat, the water will quickly drain away from the roots of the plant, so that it never gets waterlogged. Well draining soil is a must with this succulent. It definitely does not like wet feet. Choose a porous cactus or succulent potting mix which will allow for quick draining of water. The plant has pink and magenta flowers but mine has not flowered yet, so I don’t have a photo from my plant. The plant blooms in late summer and early fall. This photo was kindly shared by Kathy Smith on Instagram (@justkathyslife). Kathy said the flowers were on a two FOOT stalk with the blooms cascading off the end. I can’t wait for mine to flower. I’m so jealous! Thank you so much for sharing this Kathy! The leaves of Echeveria Neon Breaker form rosettes. They have waxy, crinkled edges with pale blue green centers and bright pink margins. The plant can form a rosette up to 8 inches in diameter and will grow to about 5 inches tall in the right conditions. The outer leaves of the succulent are larger and longer than the inner leaves which leads to a pretty rosette shape. The center of the rosette has the most curly petals and very bright margins. As the mature leaves age, they discolor slightly. Clean up the plant by removing old leaves. This succulent is a tender perennial, which means that it will only over winter in the warmer zones. It must be protected from frost which can easily cause scarring of the leaves. 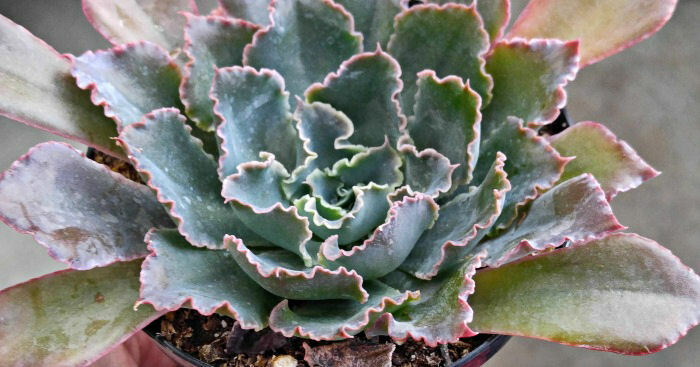 Heavy frost will kill the plant so it is better grown as an indoor plant in colder zones..
Echeveria Neon Breaker looks lovely in rock gardens if you live in the warmer hardiness zones. It makes a great patio plant and looks pretty in dish gardens and open terrariums. It is small and can be planted in all sorts of containers from clay pots to small watering cans and tea cups. (See more succulent planter ideas here.) This succulent will attract hummingbirds. The large rosettes of Echeveria Neon Breaker are also ideal for bridal bouquets. When the plant becomes root bound, repot in a pot that is 1/3 size larger. Remove the dead leaves around the edges to prevent pest and diseases. If you re-pot immediately after purchasing the plant to get a same size but prettier container, be sure to inspect the plant carefully. Often nursery plants will have pests that can infect other plants in your collection. This plant is patented. Some retail labels on Echeveria Neon Breaker pots state that propagation is prohibited. Strictly speaking, this means that the only way to propagate it would be through natural pollination. The plant will not come true from seed if it is a hybrid. However, this stipulation seems a bit odd to me, since natural propagation can occur when the plant drops its leaves and they root in the nearby soil. 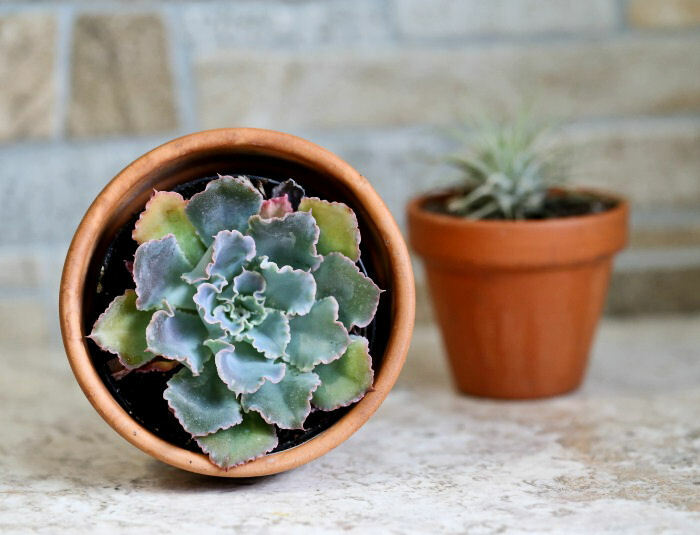 Removing old leaves would be the only way to make sure that you never propagate this succulent. That being said, the plant roots easily from leaves and will also send out offsets that form clumps which can be re-potted. This succulent is an original hybrid of Altman Plants who have it for sale at the moment. 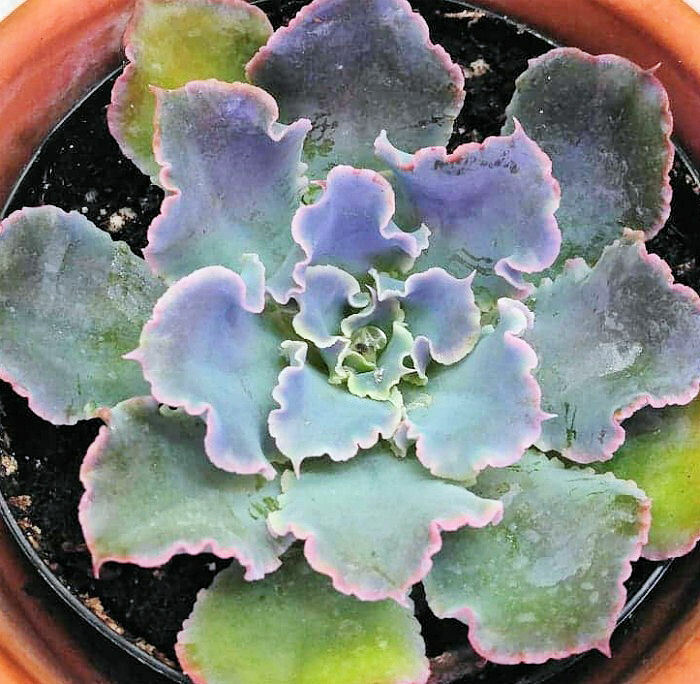 Echeveria Neon Breakers is a tolerant plant that is easy to care for. It’s brilliant colors will brightens your garden both indoors and out. Hi Margie. Transplant shock is common when moving from one container to another or from outdoors to a pot. It is normal since you have disturbed the roots. Outdoors the plant would have gotten a lot of light and indoors, this can be a problem, particularly with succulents. Even those in south facing windows don’t do as well for me in the winter. I’d let it get almost dry about an inch down before I try to water. A specially formulated cacti succulent soil might have been better than normal soil but I wouldn’t do this until the plant has perked back up. There is a product called Miracle Grow quick Start which is reported to help with transplant shock. It is an nutrient additive that encourages root growth for a plant when it is being moved to a new container. I have not tried it so I can’t vouch for it and I suspect it is better suited to flowering plants than succulents. Might be worth a try if all else fails. First time to grow an Echeveria plant. It had 2 tall stems that bloomed and later 2 more. It was beautiful, But I don’t know what to do from here. I have it in the garage for the winter at about 45 degrees. Do I leave the tall stems or cut them back? It seems to be wintering well and I give it a little drink occasionally. Is the right thing to do? Any advice is welcome.